The Dormer’s Force M Drills are designed for drilling stainless steel materials across various machines and conditions. The drill’s split point design increases chip formation, tool strength and wear resistance. 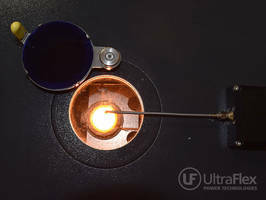 The units are made from micro-grain carbide with multi-layered Titanium Aluminum Nitride coating. The drills come with an internal coolant delivery in sizes from 3 mm to 16 mm and 1/8 to 5/8 in. The units feature a strong corner design that increases stability and reduces the force encountered during drilling. We have extended our Solid Carbide “Force X” program with a specific range for stainless steel applications called “Force M”. The Dormer Force M assortment of drills provide a high level of productivity specifically for drilling Stainless Steel (or ISO-M) materials while operating consistently across a diverse variety of machines and conditions. This makes them ideal for high production, general engineering and sub-contract environments. Their Force M “material specific” drilling family introduction follows the recent launch of the Force X drilling family which was designed for use in a wide range of materials. All of the Solid carbide “Force” drills in the program feature a modified four-facet split point geometry, to enhance self-centering capabilities and improve hole-quality. Also, this split point design improves chip formation, tool strength and wear resistance specifically in these tough ISO-M materials. A unique feature of all “Force” family drills is their Continuously Thinned Web (CTW) technology flute construction. This offers a very strong web design, while at the same time reducing thrust forces during drilling. Combined with the drills’ consistent edge preparation, which provides predictable wear, CTW supports a highly consistent and reliable drilling process. 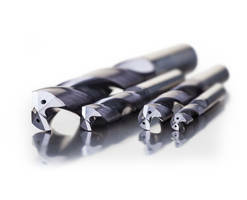 Each drill in the Force range is manufactured from premium micro-grain carbide along with a multi-layered Titanium Aluminum Nitride (TiAlN) tool coating to provide an excellent combination of hardness and toughness, resulting in high wear resistance, longer tool life and higher productivity. A strong corner design increases stability and reduces the forces encountered during drilling and especially during breakthrough at the exit surface, in both general drilling and cross-hole applications. Supporting drilling depths of 3xD solid construction (R458) or coolant through (R467), and 5xD solid construction (R454) or coolant through (R463) the Force M drills feature internal coolant delivery in all sizes from 3mm to 16mm and 1/8 to 5/8 inch. To browse the comprehensive Dormer Force M selection, visit us online at www.dormerpramet.com.